Towering 461.5m (1,513.0 ft) high, the $123 million project took almost three and a half years to complete and involved more than 2,500 construction workers. Designed in the shape of a bamboo clump by British company Atkins, the shape is said to symbolise the strength and unity among Vietnamese people. Located on the western bank of the Saigon River, next to the Saigon Bridge connecting District 2 and Binh Thanh District of Ho Chi Minh City (HCMC), the 81-floor mixed-use structure sits at the heart of a $1.5 billion high-end mixed-use urban area called Vinhomes Central Park. 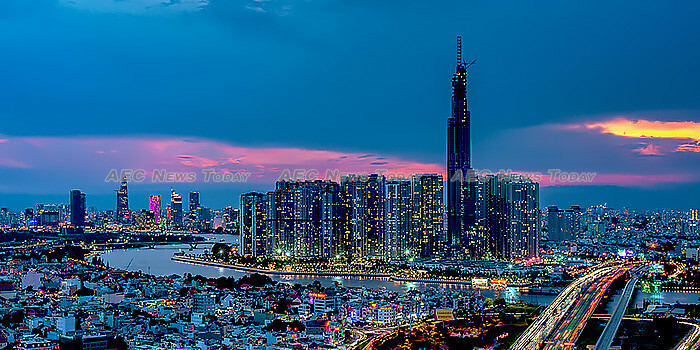 Financed and constructed by Vietnamese-owned corporations VinGroup and Coteccon, the development houses a hotel, conference venues, luxurious apartments and condominiums, shopping centres, food and beverage establishments, as well as a multi-story observation deck at the very top. The video above comprises a hundreds of individual still photographs taken Soren Stevens of the construction, and assembled into a time lapse video by HCMC-based Saigoneer. Pham Nhat Vuong, chairman of VinGroup, owner of the Landmark 81 project, summed the project up well. “We (Vietnamese), on our own, can construct a building of the century”.